Before you go on to thinking that I’m on some political bandwagon meant to despise President Trump, I assure you I have had the same disdain for how Muslims and Sikhs have been racially profiled when Obama was President. You have never heard of people being detained at airport for having a certain suspicious-sounding name because your media has little interest in covering such stories. I get it. It’s irrelevant to you if a citizen of India is held in a room for hours with no explanation and no legal representation. It has happened to many Indians and while we’ve heard of the famous ones including actors and the former President of India (no joke), there are many, many people who will never get to complain about it to a reporter since it’s just not newsworthy. India treats citizens of Pakistan the same way at airports and vice-versa. It is a political stunt and these methods violate every human right. I have always had the best experiences with Customs and Border protection (CBP) officers coming into the US (minus that time I had my wallet stolen/lost my greencard and got the stink eye). When I was on a non-immigrant visa, I had to pass a short interview at the port of entry where the officer asked the purpose of my visit, how long I would be staying. If they were in a good mood they would make small talk. They took my photo, fingerprints and possibly looked me up on their computers to make sure I was entering legally. I always was. If you’re not a US citizen and are travelling for business or fun, you have to apply for a visa and it takes money, a binder full of documents and some level of confidence to prove to a consular officer that you’re coming back home. Post 9/11 it has been a stressful process for people making a similar journey. There are hundreds of websites and forums coaching you on what to wear, how to act, how to answer questions (always to the point!). I was scared when I applied for a B1/B2 visa on my own. I sweat through my armpits and that day was no different. My white shirt had wonderful patches reaching halfway to my waist. Nobody wants to be rejected especially when it’s so expensive and time-consuming to apply in the first place. I just wanted to come and meet Matt that time. I was terrified to put that decision in someone else’s hands but fortunately I got approved. Another “good to know” is that getting a visa stamped on your passport means nothing. They tell you this in as many words: “A visa does not guarantee entry”. It all depends on the CBP officer. I could be turned back just as easily and it would not be cheap though I would still have the privilege of going back to country that is safe. I have always got in and I am thankful that as a permanent resident (aka greencard holder) I get to be with my husband. I would be lying though if I tell you I’m not scared that this might not always be the case. If you seriously think the immigration laws and foreign policy concerning refugees is lax, you have obviously never had to go through the process. They do their jobs very well. Trust that. I cannot imagine how hard it must be for couples like us and family members forced to be apart when just a few days ago there was a promise that they would get to be around each other again and sit at the same table to enjoy a meal. I don’t take this for granted. I can’t. I don’t have the right. I hope you take my words and understand that I have privileges of many kinds. I have felt heartened to see how many people have shown up in airports to protest the release of people who have every legal right to be here no matter whom they pray to. If you’re watching it from the sidelines (ahem privilege) and thinking “well how does this affect me?” remember that you said that 10 years from now. I’m scared to have written this but it has been on my mind too much to tune out. Things might not get better until it’s too late (journalist talking) but things will get better (teenager talking). I am optimistic because I see you showing up. And that gives me hope. 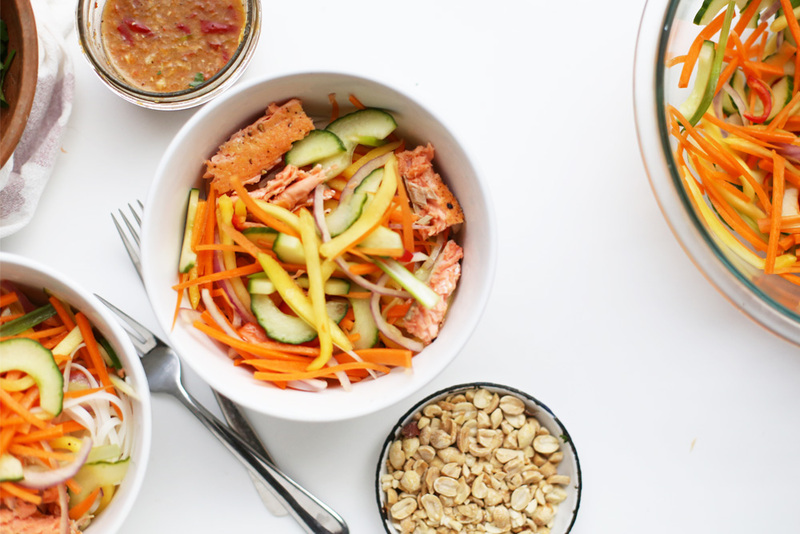 Ruby Tandoh – the woman who wrote this recipe – was inspired by Vietnamese cold noodle salads. She made the recipe with steak which I also did the first time I made and loved it. I made it with salmon this week and I’d love to try it with prawns as well. She suggests using any kind of frying steak and says not to get hungover “good” and “bad” meat in her recipe notes. I can’t wait for this book to come out in the US. This meal is somewhat heavy on the vegetable prep (mostly the carrots) but once you get it all together, it’s just a matter of tossing it with the dressing and digging in. I like to keep the dressing and noodles separate until I’m ready to eat it. This gives everyone a change to use as much or as little of the dressing as they like. 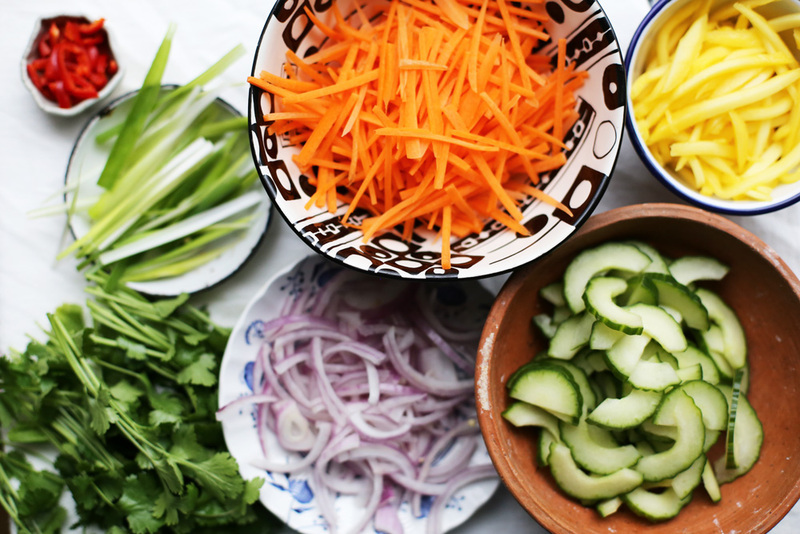 Prepare all the vegetables and the cilantro and add them all to a large bowl. Heat the oil in a frying pan until it sort of shimmer and add the salmon to it. Cook skin side down for about 4 minutes. Flip the salmon over (it should release easily from the pan) and cook for 2 more minutes. Set the fish aside on a plate and prepare the noodles. Place the noodles into a wide heatproof dish or bowl and pour boiling water over them. Let them soak in the water for 4 minutes or so to rehydrate. Drain and rinse the noodles under cold water to cool. Cut the fish into ½–1 cm-wide slivers (like fish fingers). Whisk the fish sauce, lime juice, honey and sesame oil in a jar until the honey has dissolved into the liquid and add the red chill to it. Crush the ginger and garlic using a mortar and pestle (finely chop them with a knife if you don’t have that equipment) and add it to the liquid. Whisk it until it’s evenly spread out in the dressing. 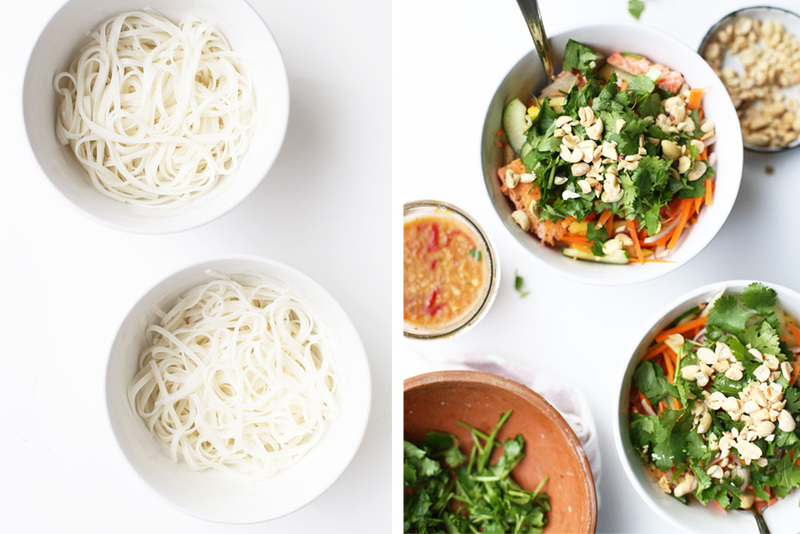 Heap the prepared vegetable on top of the noodles into 4 bowls. 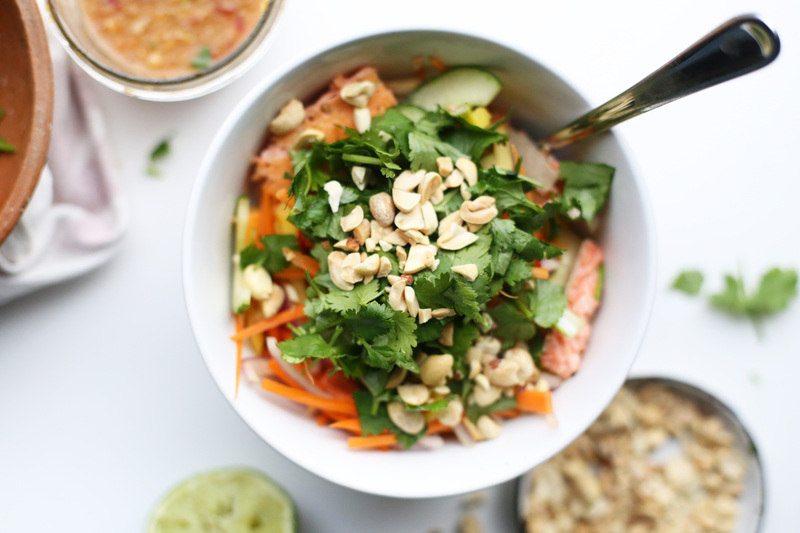 Top with the salmon, cilantro and peanuts. Pour as much dressing as you and your people prefer over their bowls and gently toss. Serve with lime wedges. It’s definitely maddening but in no way is it demoralising. I think we have to pick and choose our battles and that’s keeping me afloat. Thank you for showing up so much. I always liked this country because of some of my family are products of it but I think I’ve found a love all of my own and that makes me so happy. 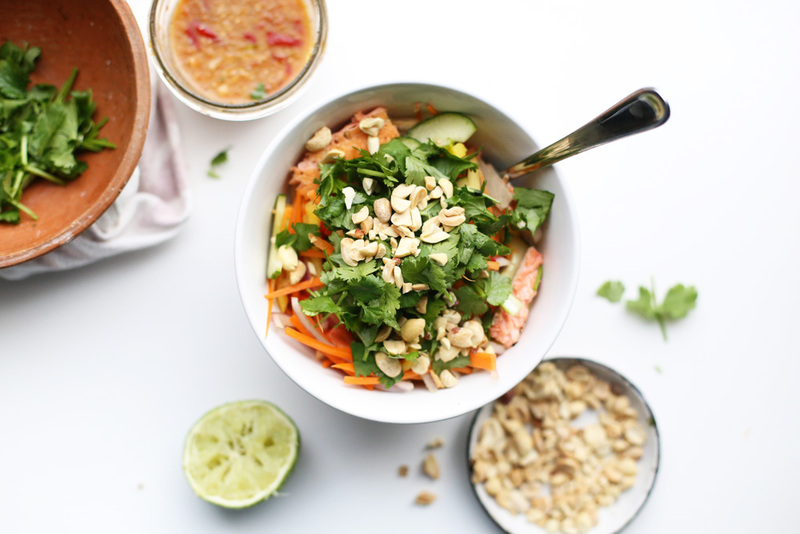 This is my favourite kind of recipe – SE Asian flavours top my list, fresh veggies, noodles & peanuts just take the cake. Thank you for sharing. And also your thoughts on living away from home, not only in this post but others as well. It’s something I think about sometimes, even though I’ve always vehemently opposed the idea of migrating to another country, however wonderful. It makes you think about how feeling safe or a sense of belonging has nothing to do with having the birthright or the permission to live in a country, even your own.